Whether you're a seasoned installer or you've bought your first cold-air inflatable and need a few pointers, you're in the right place. Landmark inflatables come complete with tethers and appropriate blower. Putting them all together for a successful installation is easier than you might think! Have a question that isn't answered in the articles below? 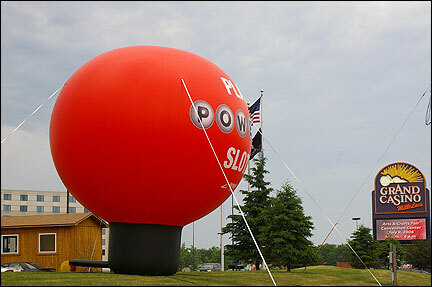 Interested in buying a Landmark inflatable? Contact us today for additional information and assistance. First Time Using Advertising Inflatables? Are you intimidated about the inflation process? Don't be! In less than 5 minutes, your balloon can be standing tall. Take about 5 minutes to watch this step-by-step video and you'll quickly see just how easy it is to bring your advertising inflatables to life. Need help understanding the deflation process and how to repack your inflatable? Our inflatable packing video will show you how. We also offer a print version of our instruction manual (PDF). If you've been around inflatables for long at all, you know giant cold-air and sealed inflatables need some apparatus to hold them upright. Because of their height and other physical attributes, these types of inflatables require stabilization. In addition, if used outdoors on sidewalks or rooftops, cold-air and sealed inflatables have to have a way to battle back against the elements. Aside from your inflatable being stolen, having it damaged in some way during an event is just about the worst thing that can happen. However, there are several ways to quickly rectify the situation so the event can continue as planned. Once you take sheets out of their plastic bag or electronics out of all that Styrofoam, they never want to go back in! Some have said the same thing about advertising inflatables. If you promise not to tell, we'll share our finely tuned packing process with you so you, too, can repackage your inflatables with ease. Often when people call Landmark they ask how difficult inflatables are to set up. We usually tell them that basic advertising balloon installations require one to two people. Now, I'm not a large woman and I was able to do these set ups and take downs with minimum assistance. Don't get me wrong, I probably wouldn't attempt a rooftop installation alone and I'd certainly advise a do-it-yourselfer to get professional help for their first install. As for tradeshows or ground installations, however, it's a very simple process and I was out to prove that once and for all. Staking cold-air inflatables down for ground installations is an important part of a successful set up. While it may seem like an easy enough task, there are a lot of factors to be considered: Which stakes are best? Are there utility lines buried at your site? Are the weather conditions windy? Will the inflatable be safe from vandalism?